Racing blood runs through the veins of many Italian brands. Maserati’s racing programs have proved to be an excellent way of sharing the essence of its race cars with road-going models. In the 1990s, the Ghibli Open Cup race car gave birth to the Ghibli Cup and then, a decade later, the Trofeo GranSport gave birth to the GranSport MC Victory. At the pinnacle of the most recent Maserati road-to race story, the FIA GT-winning MC12 was developed directly from the MC12 Stradale. Now there is the GranTurismo MC Stradale, a road-legal super sports car with the looks and feel of a GT4 and Trofeo race car. Introduced at the Paris Motor Show 2010, the MC Stradale is the fastest, lightest and most powerful car in the Maserati range. It is the first two-seater after the MC12 supercar and Maserati have packed it with weight saving materials such as carbon fiber, improvements to power ratings, handling refinements and a top speed of over 300km/h. 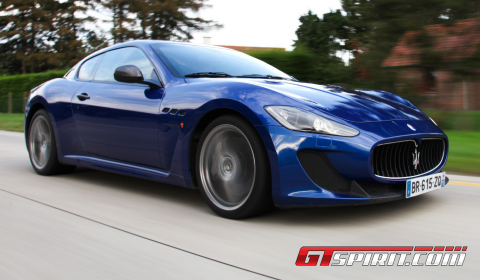 MC stands for Maserati Corsa, the factory race shop, and Stradale means road-going. 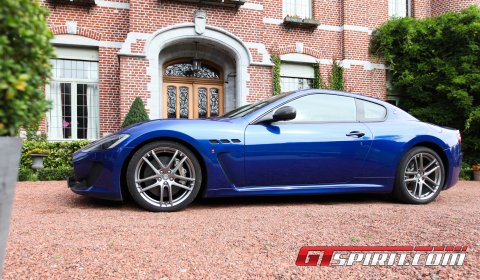 An ideal blend between on-track characteristics and the daily driver specs of the normal GranTurismo? We had to find out, so we positioned ourselves in the carbon fiber front seats with their four-point harnesses and gripped the steering wheel with its column-mounted carbon fiber paddle shifters. After the first few minutes inside the MC Stradale it becomes clear that the ride comfort, suspension setup and driver involvement have changed. The MC Stradale is a true two-faced sports car with the mindset of a GranTurismo wearing a racing jacket and the abilities of a race-bred sports car available when you ask for it. The extra 10hp over the existing GranTurismo S is hardly noticeable and only there to bring the figure to a nice round 450hp. The 4.7 liter V8 engine produces an additional 20Nm of torque thanks to reduced internal friction and an ECU remap. About eighty percent of the total amount of torque is available at 2,500rpm, which is easily felt at short sprints in lower gears. The improvements are not just mechanical though, the MC Stadale benefits from a carefully stripped-out setup saving 110kg of kerbweight. On the inside the design features of more serious race cars become unmistakable. The rear seats were replaced by a roll cage. The front seats are manufactured from carbon fiber and covered in Alcantara, and the four-point harness puts the driver and the passenger firmly in the race seat. The seat replacement itself saves a total of 42kg. Additional weight savings are realised through the installation of lightweight alloy wheels, Brembo carbon-ceramic brakes, a modified exhaust, and reduction to the sound deadening inside the cabin which saves 25kg. Leaving out the tastefulness of our test car’s interior, we can say that the seating position is quite adequate for following racing lines on a track day. The transmission is a flappy-paddle system that works pretty well, serving up spine-tingling shifts under acceleration and aggressive down changes too. In automatic mode, the gearbox is painstakingly slow and doesn’t provide the thrilling experience you would expect from a car like this. Even on daily drives it is irritating and begs to be turned off again! In Sport and Race modes, you have the ability to shift yourself and it won’t shift up or down without your say, even if you’re bouncing off the limiter. This is the first Maserati to feature a dedicated race mode. The shifts are easy, fast and precise. The main differences between Sport and Race are the improved shift times, sharpening of the throttle response and the exhaust valves which open to maximise the volume. Sport mode offers an impatient rasp from the back in lower revs and an ecstatic howl above 4,000rpm. Switch to Race and you have that same soundtrack throughout the entire rev range. The shift times vary from 140ms in Auto, 100ms in Sport to 60ms in Race, only above 4,000rpm and with the throttle at least 70 per cent depressed. Those are Ferrari 430 Scuderia shift times in a race-bred GranTurismo capable of reaching 100km/h from zero in 4.6 seconds. Hold the left paddle down, and the transmission will shift down as many gears as possible. Upshifts are the most fun, press full throttle and any next gear slams in like a smack in the face which shakes your complete body while your mind asks for more. Gear changes are addictive, not only because of the brutal upshifts and the accompanied soundtrack on downshifts, but it brings you the closest to the GT4 Trofeo blood cells added to the MC Stradale. The aerodynamic downforce has increased by 25 percent at the front and 50 percent at the rear thanks to a new front splitter and rear diffuser. The suspension package features a lower ride height, the MC Stradale loses 10mm at the front and 12mm at the rear, eight percent stiffer springs, thicker front and rear anti-roll bars and an optimal 48:52 weight distribution ensuring balanced handling and even tire wear. The two-sided story continues on subjects like handling and steering. The handling is not perfect with a small amount of body roll in bends. It is not the cornering hero we had hoped for, which is where it loses out to it’s German counterparts. In the end though, we have to agree that the fun factor is higher and the whole package more solid than the standard GranTurismo. 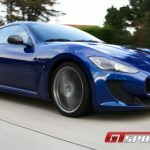 Maserati’s GranTurismo MC Stradale is easily the most thrilling car in the current lineup of the Italian car maker, and while it cannot match the true cornering heroism of sports cars made by Porsche, Ferrari, Lotus or Lamborghini it’s packed with more emotion than we anticipated and predictably high levels of driving character. The MC Stradale has that additional amount of racing flavor, but still works as a super-fast long-distance tourer.